Texan Girl Talks: Foodie Friday! Ok. So i'm completely obsessed with Tomato Basil soup. 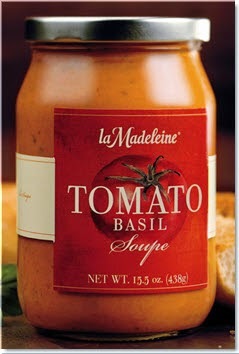 Not just any Tomato Basil soup, but La Madeleine's tomato basil soup. It's creamy, its wonderful and filled with everything my mouth loves to taste. Except for the 270 calories for a cup or 540 calories for a bowl. My body doesn't like that. My goodness. No, i'm definitely not a calorie counter, but I am conscious of what I should eat. I've come up with a recipe that is much better than some of the other copy cat versions out there. I'm also one of those salt sensitive people out there. If there is a soup thats yummy and tasty, i'll probably bloat up for days. So I always try to cut as much salt as I can without recipes tasting bland. OH life is way to short to eat bland food!!! Also, with this soup I love eating bread. Sourdough bread and Italian 5 grain are my favorites from Publix. I know, I know carbs are pretty much the devil these days, but I do believe everything in moderation and your body does need carbs to survive! A Lighter Version of "La Madeleine's" Tomato Basil soup. First, grab a pot and melt the butter on medium heat. Next, sauté minced garlic in butter, just until fragrant. Add in your two big cans of crushed tomatoes. You can really use as much tomatoes as you want and you can even use the fresh ones, if you have time. Wait about 15 minutes until the crushed tomatoes are warmed through. This could splatter. Don't be a splatter victim and add a lid and stir often. In the meantime, chop up your basil. Set aside. Put everything back in the pot and add the fat free half and half, put on medium/low heat. This will take a few minutes to reheat and don't forget to add the garlic salt, onion powder and cracked pepper. Attention salt sensitive people! Sometimes, the soup doesn't need as much salt, it really just depends on the brand of tomatoes you buy. With this recipe being only 127 calories per serving, you could definitely have some nice bread. I'm all about carbs these days. I got the nutrition facts from myfitnesspal, where I manually input the recipe! Hope you are eating well this weekend!!! Any other favorite copy cat recipes out there?! So my Sunday went like this. Y'all i'm a lucky girl. There's only 259 days left!!! Everything about this post is my life.